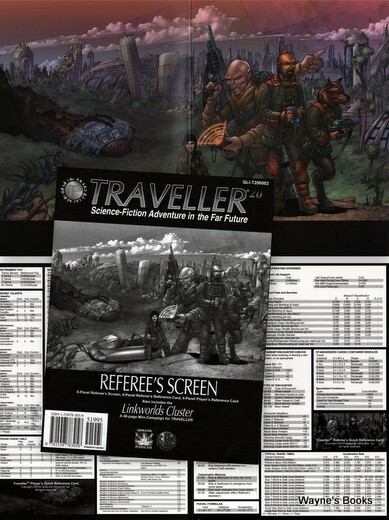 Traveller has been updated to the popular D20 rules in this beautiful hardback. Note that you will need a copy of WOC's "Core Rules" to use this book. I'd recommend the D20 Modern Roleplaying Game rules to get you started. 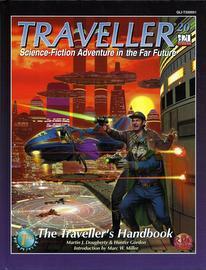 "The Travellers' Handbook - High Adventure in the Far Future! 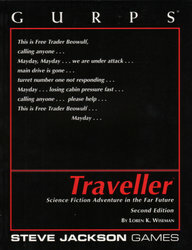 Traveller20 (T20) combines the popular d20 game mechanics with the most fully-realized science-fiction game setting ever - Marc Miller's award-winning Traveller! BE WHO YOU WANT TO BE: T20 presents 16 character classes, from brash Ace Pilots to studious Academics; from tough Mercenaries to streetwise Merchants. Characters can develop a wide range of skills and feats, from Combat Engineering to Astrogation. They can even study the powers of the mind as a psionic adept! GO WHERE YOU LIKE: Design worlds and whole star systems with the system generation rules; populate them with human and alien societies, animal life and natural hazards. The rules cover technology levels, social organization and the unpleasant consequences of hazards like vacuum exposure or radiation burns. MEET INTERESTING PEOPLE: Strange aliens and stranger humans are detailed as player and NPC races. Racial stats are presented, along with typical motivations and psychology for the various alien species. Aliens include the Vargr, Hivers, Wanderers and K'Kree, while the many human cultures include the Solomani, Vilani, Zhodani and Luriani people. FIGHT DEADLY FOES: The T20 combat system scales between starships, vehicles and personnel. Blast ships or ground targets with lasers and meson guns; battle it out with guns, grenades and hand weapons. Don powered armor or activate a nuclear damper for defense. T20 covers weapons ranging from crude clubs to gauss rifles and laser carbines, and even vehicle-mounted fusion guns. TRAVEL IN STYLE: Design, buy and operate a range of vehicles from steam locomotives to attack speeders. Trade among the stars aboard a Subsidized Merchant or captain a million-ton dreadnaught. AND THERE'S MORE: The T20 system allows any style of science-fiction adventure to be created. The whole range of human (and alien) activities are covered: speculative trade, starship combat, carousing in starport taverns… if adventurers do it, it's in here. The Traveller's handbook also contains guidance on setting up and running a T20 game, awarding experience, and tailoring the campaign to the needs of the players. It also presents an introduction to the Official Traveller Universe, which will be detailed in forthcoming releases from QuikLink Interactive!" * Complete details of one of T20's 16 character classes. * A basic skill and feat listing. * Combat rules for firearms, energy weapons and hand weapons. * Equipment, armor, and weaponry. * Vehicles and starships including the Far Trader and All Terrain Vehicle. * Simplified trade and commerce rules for starship operators. * An introduction to the Official Traveller Universe. "Personal Weapons of Charted Space is a comprehensive guide to personal weaponry in the Traveller universe. It includes full descriptions and stats for weaponry from the stone age to the cutting edge of starfaring technology. Brawling, melee and non-lethal weapons are covered, plus a vast range of ranged weaponry including slugthrowers, gauss weapons and lasers. 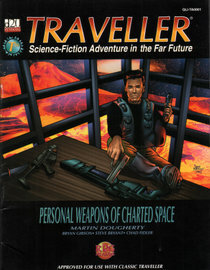 Additional material includes advice on choosing and using a weapon, concealing and detecting weapons, unique and special weapons, and a wealth of background material to make the Traveller universe richer and deeper, including the Imperial weapons permit system, and details of some of the more prominent arms firms in the Imperium." INCLUDES: 8-panel Referee's Screen; 4-panel Referee's Reference Card; 4-panel Player's Reference Card; Linkworlds Cluster: A 48-page mini-campaign. Settled long ago during the Rule of Man, Gateway Domain is both backwater and frontier: a bastion against foreign influences and a pathway for commerce. Yet the Domain is beset by troubles within and without: war with the Solomani, turbulent Imperial politics, and the machinations of the sinister Lords of Thunder. It is here, in the Gateway Domain, that the fate of the Third Imperium will be decided. Gateway Domain is indeed the gateway to destiny. 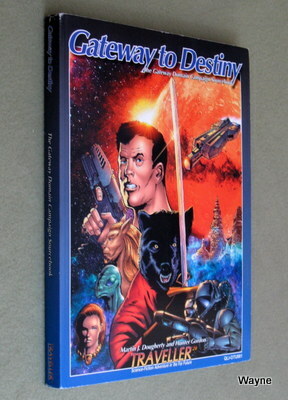 This sourcebook, forming part of the official Traveller universe, presents the whole of Gateway Domain in a single volume. Within are details of over 1000 worlds scattered across four sectors of space, plus a wealth of information on the people, places, and wonders of this troubled region. * History of the Domain: A detailed history of the Gateway Domain, covering the rise of its native inhabitants, the later explorations and settlement of the region, as well as the political and military events of the region. A complete timeline is also provided. * People of the Domain: The Domain is dominated by Humaniti, but numerous alien races with their own agendas and desires also inhabit the region. * The Dominant Powers: A comprehensive look at the most influential power of the region, the Third Imperium, as well as the three other dominant interstellar states bordering the Domain: The 2000 Worlds of the K'kree, the Hive Federation, and the Solomani Confederation. * The Pocket Empires: Located throughout the region the Domain encompasses are more than 30 individual interstellar states of varying size and ideology, with detailed backgrounds provided for each. * Organizations and Megacorporations: Governments aren't the only ones that wield considerable influence and power across the region. From the 13 Imperial chartered megacorporations to the various political and religious movements to the smaller supercorporations of the region, all are covered. * Personalities: An introduction to a number of major and minor power players in the Domain, including Archduke Erechs and his rival for power, former Archduke Nells, as well as the K'kree Nar'grxltir, who is known to represent both the interests of the 2000 Worlds and the Lords of Thunder. * Political Map: A full-page map denoting the coverage and locations of the major and minor interstellar states and polities within the Gateway region. * Quadrant Maps: 16 full-page, detailed Quadrant maps covering all four sectors of the Domain. Each map is broken down into four subsectors and supplemented with full Universal World Profiles for each world. Further, more detailed profiles are provided for three worlds within each quadrant. * Adventure! An entire chapter is devoted to providing tips, suggestions, and inspiration for running adventures in the Gateway Domain. To further kickstart your campaign, a full-length adventure is included!" 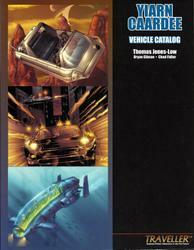 "Over 80 vehicles are detailed in this catalog including ground vehicles, grav vehicles, and watercraft from across the technological spectrum. You'll also learn new tips, tricks, and design-options for creating your own vehicles based on the 720 rules direct from the Yiarn Caardee design team itself! For those who enjoy pushing their vehicles to the limit of their own abilities, included are detailed rules for organizing and conducting vehicle races, as well as the licensing requirements and laws concerning the operation of these vehicles." 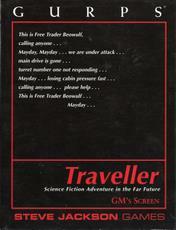 GURPS Traveller, by Steve Jackson Games, is the home of one of the in-print versions of Traveller. 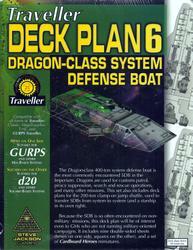 GURPS is a fine game system, and its d6-based mechanics translate well to the old Traveller supplements. Note: You'll need the GURPS basic rule books to run a game. "Hang in there Beowulf. Help is on the way . . .
Marc Miller's Traveller is one of the most fully realized game backgrounds ever created ... a vast empire of over 11,000 systems, with a turbulent history dating back thousands of years. Locales can range from a crowded spaceport to a lonely frontier outpost, from the teeming cities of the Core to the unexplored worlds on the edge of the Great Rift. Characters can be merchant princes, diplomats, soldiers, politicians, nobles, criminals ... or all of them at once. Political intrigues, trading schemes, mind-wrenching alien enigmas, mercenary raids, wars . . . almost anything is possible. GURPS Basic Set, Compendium I: Character Creation, and GURPS Space are required to use this book in a GURPS campaign. Ultra-Tech and Ultra-Tech 2 will be useful. 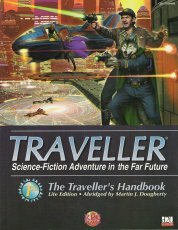 As a sourcebook, GURPS Traveller can be used with any SF campaign. melds this exciting universe with the rules system of GURPS, and includes rules for creating new characters and for converting old ones from other Traveller rules systems. It includes a modular starship construction system (fully compatible with GURPS Vehicles) and a space combat system for ship-to-ship encounters. GURPS Traveller also brings you the official alternate universe for Traveller; in which Emperor Strephon, and the Third Imperium, have survived to face new challenges. Continuing support for this line includes books on alien races, scouts, worlds, and playing a mercenary in the Traveller universe. GURPS Basic Set, Compendium I: Character Creation, and GURPS Space are required to use this book in a GURPS campaign. Ultra-Tech and Ultra-Tech 2 will be useful. As a sourcebook, GURPS Traveller can be used with any SF campaign." 2 two-sided screens with 1 floor plan poster and 1 sheet of Traveller-specific Cardboard Heroes. Contains rules necessary for a realistic Traveller campaign. 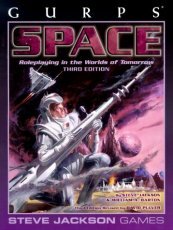 "GURPS Space is the star-spanning sourcebook for GURPS - now revised and expanded for its third edition. • Scientifically accurate and up-to-date rules for creating star systems and planets... either randomly or to fit a specific campaign. • Detailed guidelines for creating futuristic and alien governments and societies. • An informed look at the technologies of tomorrow: what will be, what might be, and beyond! • Character-creation resources for space campaigns, featuring 24 character types, three variant human races, and four alien races. • A full science-fiction equipment list, including weapons, gadgets, and medical technology. • Realistic treatments of the dangers of noxious atmospheres, crushing gravity, vacuum, radiation, and other hazards of space travel and exploration. • A self-contained, GURPS Vehicles-compatible starship construction system, covering TL8 (just around the corner) to TL13+ (superscience). • Complete ship combat rules - no ship counters, just roleplaying - for playing out ship-to-ship battles. GURPS Space does not tie your game to a single background. Rather, it is designed for the creative GM who wants to develop his own universe! This book presents a wide variety of choices and background information to let you recreate your favorite science-fiction background - or build your own." "Behind The Claw: Slang phrase referring to those regions of the Third Imperium lying beyond the Great Rift. Almost a year from the Capital by Xboat, the Spinward Marches is a frontier region, scene of five Frontier Wars and innumerable skirmishes. The Marches are one of the most troubled regions of the entire Imperium. 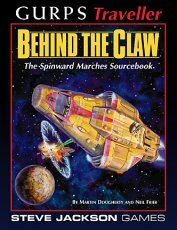 Behind The Claw details the Spinward Marches, a complete sector of space. Over four hundred star systems are described in detail, along with essays on the Imperial Nobility and system of government, a detailed history of the region, referee's information, current events and a wealth of adventure material. The setting is rich and diverse, with unlimited scope for adventuring. The Spinward Marches was first sector to be covered in the original Traveller background, and it is where the vast majority of campaigns are set. In many ways, it is Traveller's 'home.'" "Everything you need for a military-oriented campaign in the universe of Traveller! This book covers combat (and a soldier's life) in the 57th century; how to recruit, organize, and equip a mercenary unit; and the Imperial rules of war. There are descriptions of how armies are organized and equipped for Tech Levels from 5 to 12, discussions of strategy and tactics, and a comprehensive rundown on weapons and the other tools of the soldier's trade. In addition, deck plans for the 800-ton Broadsword class mercenary cruiser are included. 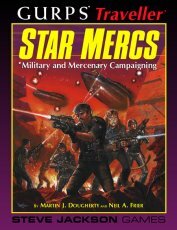 Star Mercs also includes templates for military and mercenary soldier characters, sample missions, and a variety of units and NPC personalities your mercenary group might encounter, including the famed and feared Imperial Marines." "Beyond the borders of the Third Imperium, the Interstellar Scout Service seeks out strange new worlds! A Scout has to be ready for anything . . . or die. 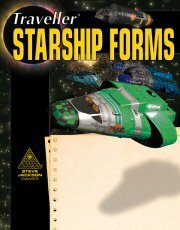 This book describes the Scouts' organization, equipment, starships (with deck plans including the Express Boat, Donosev-class Survey Scout, Khadumir-class Fast Courier, and Purcell-class Express Boat Tender) and typical missions. To make running a Scouts campaign easy, it also details the whole process of exploration, from the initial sighting of a new star system to the integration of a world into the Imperium. First In includes a world-building sequence based on the most recent scientific discoveries. Game Masters can now design realistic star systems, worlds and civilizations. The system can be used for GURPS Traveller , or easily adapted to any other science-fiction RPG." * Develop sector-wide trade routes, following the demands of commerce on an interplanetary scale. * Start your own character-run business, raise capital, and finance your money-making ventures. * Make contacts, find niche markets, and exploit opportunities the big corporations miss. * Learn what it takes to run a successful commercial starship. * Expand your world with 15 new character templates. * Run entire mercantile campaigns, including free traders, smugglers, and pirates. "Patrol, trade and Xboat routes are the lifelines of the Imperium, and starports are the anchors to which they are tethered. Serving as trade centers, customs offices and outposts of civilization in far-flung systems, they play a central role in the lives of starfarers, and are a crucial source of goods, wealth and information for even the most planetbound of souls. At the same time, they are havens for smugglers, fugitives and black marketeers. Starports classifies standard starports and describes their facilities, organization and functions. 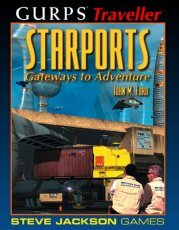 It includes examples and plans, and guidelines for starport adventures and encounters. 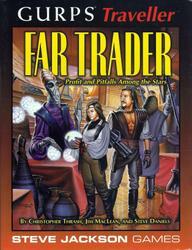 It is designed to complement Far Trader and the upcoming Starships supplement." "From launches to liners, from patrol boats to pirates, a starfaring campaign requires ships. 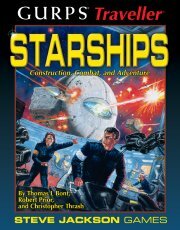 GURPS Traveller: Starships details the "View from the Deck," the experience of being aboard a starship. Passengers and pursers, bridge crews and black gang, owners and deckhands . . . they're all here. Charters and salvage operations are included, spiced up with encounters, adventure seeds and a cast of NPC owners, masters and crew. Much of the book is devoted to ship designs and design philosophy, with a selection of starships and smaller vessels -- the traders, lab ships, yachts and prospectors likely to be crewed by PCs. Each ship has its own detailed writeup and deck plans. Another section expands on the starship design rules in GURPS Traveller (including components for TL 7-9, TL 11, and TL 13 designs). It collects all previously published components in one volume and offers new accessories and design options, as well as descriptions of the technology. * SDB and Jump Shuttle (Dragon class)"
"When human worlds are threatened, people depend on the Imperial Marines and the Unified Armies -- the Ground Forces. They are the only soldiers most citizens ever see. People may follow orbiting battleships as bright 'stars' in the sky, but for the average man it is the Marine in battledress and the imposing bulk of an Army grav tank that embody the Imperium. 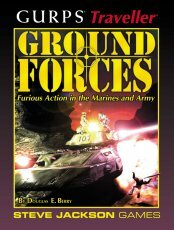 GURPS Traveller: Ground Forces covers the "ground pounders" of the Third Imperium and their comrades in arms, the sailors of the "wet" navy and the pilots of the Close Orbit and Aerospace Command. " "The Solomani Rim sector lies at the rimward edge of the Third Imperium. It is an ancient, densely populated region. For 6,000 years, the Solomani Rim has been a place of epic revolutions and wars. Today it remains a flashpoint for galactic conflict . . . The Third Imperium occupies hundreds of worlds, including Terra, the human homeworld. But much of the sector is under the control of the despotic Solomani Confederation. 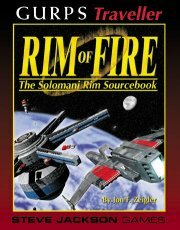 Rim of Fire covers the Solomani Rim sector in detail. Writeups for over 400 worlds are included. Some are described in great detail, providing instant adventure settings, while others are merely sketched in to allow the individual GM to customize his campaign. There is also an extensive history of the sector, including detailed descriptions of the Interstellar Wars and the rise of the Solomani Movement. And, of course, there are campaign and adventure seeds, and a trove of referee's information. The Solomani Rim has always been a place where the actions of individual heroes could change the course of history. Today there are still many challenges for the GURPS Traveller player. . . on the Rim of Fire!" "Often dubbed 'the workhorse of the Imperium,' the modular cutter is the primary ship design for intrasystem transport. Its flexibility made it popular; its durability made it essential. In Modular Cutter, you'll find dozens of designs for ship modules that can be swapped out at a moment's notice. You'll also find new ideas for using the modules, from space stations to interstellar cargo ships. Traveller fans have been asking for this book for years!" "In the Traveller world, aliens come in all shapes and sizes. But Humaniti, the many varieties of humans descended from Earth's Homo sapiens, all look pretty much the same. Looks, of course, can be deceiving . 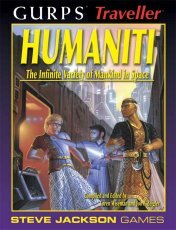 . .
GURPS Traveller: Humaniti gives you in-depth information on 16 varieties of Humaniti, including Acheron, Answerin, Azhanti, Darrian, Dynchia, Geonee, Iltharan, Irhadre, Kargol, Luriani, Nexxies, Otrai, Suerrat, and Yilean -- some never detailed before!" From the Imperial family to the lowest knight; from the fantastically wealthy duchess on her private estate world to the impoverished baronet who barely has a Free Trader's bunk to call his own; from the archduke who governs hundreds of worlds to the knight with no formal duties – in Traveller, the aristocracy plays a major role in society, in government, and in the military. Would you like to serve one of the Imperium's nobles . . . or be one? 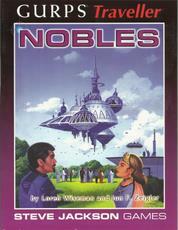 GURPS Traveller: Nobles details the lifestyle, fortunes, duties, and responsibilities of the nobility in the Third Imperium, the Vilani ruling class at the height of the Ziru Sirka, and the Darrian and Zhodani systems. A close-up look at the most powerful people in the GURPS Traveller universe, with complete GURPS stats for 13 major characters – including Emperor Strephon and Empress Iolanthe – and capsule biographies of many others. Deck plans for the Wanderer-class yacht, the Midas-class courier, and the Condor-class racing yacht – all new starships. Plus floor plans of mansions and private getaways. Details on life in the Imperial Palace . . . wealth, power, danger, and intrigue. If your Traveller campaign aims for real power, here's where it will climax." "The Sword Worlds stand at the border of the Third Imperium, a small but proud civilization descended from ancient Terran migrants. Their inhabitants have spent centuries fighting for independence - from the Imperium, from the other great empires, even from each other. 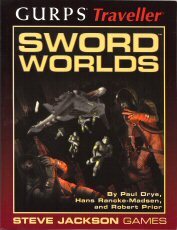 • A history of the Sword Worlds as a whole, from the first colony to the last disastrous war with the Third Imperium. • In-depth information on the present-day political situation, in which the Third Imperium, two Sword Worlder alliances, the Darrian Confederation, and other regional powers all vie for dominance. • Detailed descriptions of the individual Sword Worlds - local history, geography, politics, organizations, and important personages. • Extensivelibrary Data, covering the important concepts of Sword Worlder society. • Character design guidelines, along with sketch biographies and character writeups for a number of interesting figures. • Spaceships, vehicles, and technology specific to the Sword Worlds civilization. Cling to honor and tradition in a universe turned upside down - live the Sword Worlds today!" "The human-descended Zhodani have long embraced psi powers in their society, in contrast to the persecution that psis suffer within the Imperium. The Vargr are a race of aliens descended from transplanted Terran canines. Both are formidable rivals to Imperial power in the Spinward Marches sector. 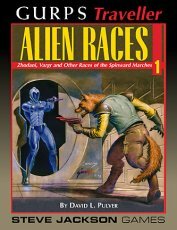 Alien Races 1 for GURPS Traveller has everything you need to set a campaign in the Zhodani Consulate or Vargr Extents. It includes starship deck plans and vehicle designs; typical weaponry; rules and templates for creating player characters; up-to-date history and cultural information, and much more. Also, seen here for the first time are three significant "minor races" from Zhodani and Vargr territory: the tyrannosaurian Drakarans, the arachnoid Clotho and the enigmatic Sheol. 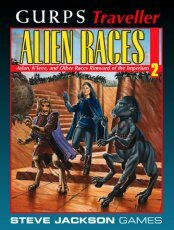 Almost unknown in Imperial territory, these races are growing powers in the Zhodani Consulate and the Vargr Extents..."
"The second book in the GURPS Traveller Alien Races series, Alien Races 2: Aslan and K'kree addresses the biology, home worlds, culture, and society of the fierce Aslan, the centaurian K'kree, and two minor species. 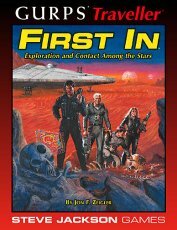 It details their historical involvement with the Imperium, from first contact to present, and presents racial templates, rules for playing alien characters, and examples of unique technologies and ship designs. The Aslan warrior race has a mindset focused on honor and glory; their traders and mercenaries are found throughout the Spinward Marches and the Solomani Sphere. Their wanderlust and combative nature make them well-suited to adventuring as player-characters. Their habit of insidiously grabbing land when no one is looking also makes them good recurring adversaries in a campaign. The militantly vegetarian K'kree are driven by their faith to rule the Galaxy, and eliminate all meat-eaters. Players may join this crusade, fight against it, or simply try to make a living while it goes on around them. The K'kree are constantly embroiled in skirmishes with the Vargr, and keep an uneasy peace along their borders with the Hivers and humanity. 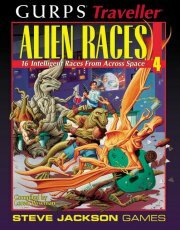 Alien Races 2 also features two new minor races: The Inyx are a race of aquatic parasites who absorb electrical energy from their whale-sized hosts. The Devi Intelligence, an unusual K'Kree subject race, consisting of the sedentary Intellects, who resemble colonies of giant fungi, and their mobile spores, the Shiverbats." 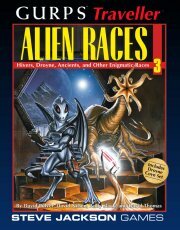 "The third book in the Alien Races series describes two of the MOST alien races in the Traveller universe - the Droyne and the Hivers. The Droyne, which Imperial archaeologists are beginning to suspect are identical to the ancient race that scattered Humaniti and created the Vargr, are among the most pacific of all the inhabitants of the Imperium. But if they were once so powerful, why have they given up on the jump-drive and the other trappings of interstellar power? What did they learn that Humaniti will not? And what about the Hivers, the strange six-limbed creatures who dominate dozens of other races within their Hive Federation? Why do they treat their offspring so strangely? Does their incredible intelligence translate to wisdom? Or does their lust to manipulate others represent a threat to the Imperium? Also described are three minor races: the Hiver's laughing mercenaries, the Ithklur; the tiny nocturnal Lithkind; and the fluorine-breathing Inheritors, who inhabit a Dyson sphere created by the Ancients. Special bonus! This book includes 'gold' cardboard punch-out versions of the 36 Droyne coyns, and complete instructions for Droyne divination. Droyne characters can now 'cast the coyns' to determine their future actions . . . and Human characters can wonder why it works . . ."
"Enough aliens to fill a cantina! GURPS Traveller Alien Races 4 brings 16 strange species to life, including the winged Ael Yael, the bureaucratic Bwaps, the nonviolent Virushi, and the newest species to be recognized as sentient, the aquatic Shalli. Compiled and edited by Loren Wiseman and Steve Jackson, this book features the creations of several favorite Traveller authors, including Phil Masters, David Pulver, and David Thomas." "The first of a new series of 32-page GURPS Traveller books, each one a detailed look at a single planet. Written by Loren Wiseman and Steve Jackson, this book describes a planetary theme park -- a whole world dedicated to entertainment -- but with a hidden dark side. 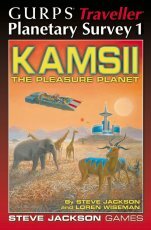 From family fun to lavish decadence, from hundred-mile kiddie rides to recreations of the court of Caligula, Kamsii has it all. The Kamsii Company says everybody will have a good time, and nobody crosses the Company. Not twice." "The second of this new GURPS Traveller series, each of which has complete stats and adventure information for a new planet. Planetary Survey 2 presents the homeworld of a recently discovered intelligent race... the Shriekers. Unfortunately, all that most of Humaniti cares about the Shriekers is that their eggs are precious jewels. Will you help the Shriekers, or help wipe them out for profit?" "Granicus, in the Glimmerdrift Reaches sector, is home to over 25 million people. Its corrupt, faction-ridden government and out-of-the-way location make it the perfect base of operations for pirate cartels, whose criminal enterprises reach into Imperial space. The cartels are the secret masters of the planet. But in every corner lurk Imperial spies, looking for ways to combat the pirate threat." 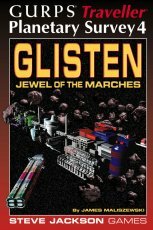 "The 'Jewel of Deep Space,' the Glisten system has no habitable world, yet it is the capital of the Glisten subsector, site of a Scout base and a major shipbuilding yard, and home of the Mining School of Glisten. Its rich asteroid belts combine an advanced technology with an almost inexhaustible supply of raw materials. Glisten is a major industrial and economic powerhouse in the Spinward Marches. This book concentrates on the five asteroids which make up 'Glisten City,' the government and business center of the system. Trade, business, scientific investigations, and high-level politics rub shoulders with gritty asteroid miners, huge factory complexes, shipyards, and interstellar intrigue." "Our new GURPS Traveller series continues with an in-depth (so to speak) look at Tobibak, a world covered by ocean. Humans cooperate with aquatic races to develop a planet with many resources . . . but where dry land is the rarest commodity of all!" "Welcome to Darkmoon Imperial Prison. I am Warden Kaede Malone, and you are very lucky. Instead of a filthy, lice-infested prison mine, you've come to a clean, state-of-the-art correctional facility. "Darkmoon Prison is operated under Ministry of Justice charter by Schunamann und Sohn AG. You will work hard to repay your debt to society for the crimes you committed, and your debt to SuSAG for providing the necessities of life here. If you demonstrate contrition and participate in recommended programs, you may qualify for a change in your status and stay at a minimum-security facility. I see the mention that this is a SuSAG operation has caused a stir. Don't be afraid! SuSAG pharmaceuticals are all extensively tested on animals before any human trials are run." 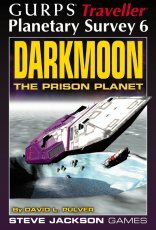 The Darkmoon system has been many things – a base for the Imperial Navy, a System Defense Boat and Space-Submarine Warfare School, the last stop of a fringe group of cultists seeking to escape the downfall of civilization . . . but when the Navy left, the system became a backwater, and economic ruin set in. To the rescue came the megacorporation Schunamann und Sohn AG, who took over the SDB School and turned it into a maximum-security enterprise. On a gas giant moon under miles of ice and water, this "escape-proof" prison is the final stop for 3,000 of Imperium's worst scum, from corsairs to Ine Givar terrorists. But Darkmoon is no ordinary prison world . . . a prisoner who steps out of line may find that he's been reclassified "lab rat." "First in a series of mini-books that spotlight interesting professions for adventure! 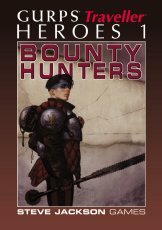 Bounty Hunters gives templates for character design, and goes into detail about the risks and rewards of hunting criminals for money. Campaign ideas and adventure seeds are included, along with several completely worked out characters. This book will jump-start lots of Traveller adventures!" This product was announced, but was never released, nor completed. "Make your roleplaying more true-to-life with these Imperial documents for GURPS Traveller. The set includes the two-sided Ship's Registry Form, starship construction worksheets, and many more, plus a sheet of Cardboard Heroes miniatures of a starship and spaceport crew, including Humans, Vargr, Aslan, and Bwaps." 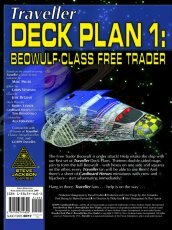 "The Free Trader Beowulf is under attack! Help retake the ship with our first set of Traveller Deck Plans. Thirteen double-sided maps join to form the full Beowulf - with hexes on one side and squares on the other, every Traveller fan will be able to use them! And there's a sheet of Cardboard Heroes miniatures with crew and pirates - start adventuring immediately!" 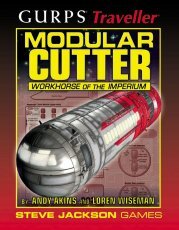 "The Modular Cutter is truly the workhorse of the Imperium . 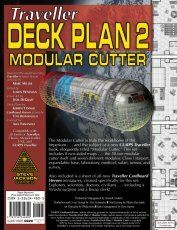 . . and the subject of a new GURPS Traveller book, eloquently titled Modular Cutter. This set includes 8 two-sided maps . . . the 50-ton modular cutter itself and seven different modules: Class I starport, expandable base, laboratory, medical, prison transport, safari, and survey. Also included is a sheet of all-new Traveller Cardboard Heroes miniatures, created specifically for this set. Explorers, scientists, doctors, civilians . . . including a Virushi surgeon and a Bwap clerk!" 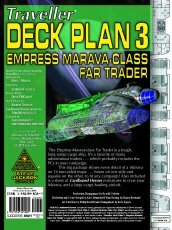 "The Empress Marava-class Far Trader is a tough, long-range cargo ship. It's a favorite of many adventurous traders . . . which probably includes the PCs in your campaign. This big package shows every detail of a Marava on 20 two-sided maps . . . hexes on one side and squares on the other, to fit any campaign! Also included is a sheet of Cardboard Heroes miniatures to crew your Marava, and a large cargo-hauling air/raft." 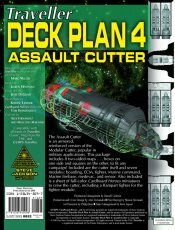 "The Assault Cutter is an armored, reinforced version of the Modular Cutter, popular in military applications. This package includes 8 two-sided maps . . . hexes on one side and squares on the other, to fit any campaign! Included are the cutter itself and seven modules: boarding, ECM, fighter, Marine command, Marine firebase, medevac, and sensor. Also included is a sheet of full-color Cardboard Heroes miniatures to crew the cutter, including a Rampart fighter for the fighter module." "The 100-ton Sulieman is one of the most commonly encountered vessels in Imperial space and on its borders. The Scout Service uses thousands of Suliemans for reconnaisance, survey, courier/VIP transport, and liaison duties; the Sulieman II seeker is the standard mineral survey craft. Retired scouts are sometimes granted the long-term use of a Sulieman for private prospecting or trade. Because this vessel is so easily available to PCs, this deck plan will be of interest to players as well as GMs. It comprises 8 double-sided sheets (hexes on one side, squares on the other), and includes a set of Cardboard Heroes miniatures to crew the ship and provide encounters." 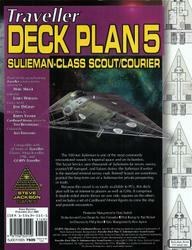 Unlike the prior Deck Plan releases - which were sold in ziplocs with a glossy cover sheet - Deck Plan 6 was released in a cover sleeve and shrinkwrapped. "The Dragon-class 400-ton system defense boat is the most commonly encountered SDB in the Imperium. Dragons are used for customs patrol, piracy supression, search & rescue operations, and many other missions. This set also includes deck plans for the 200-ton clamp-on jump shuttle, used to transfer SDBs from system to system (and a starship in its own right). Because the SDB is so often encountered on non-military missions, this deck plan will be of interest even to GMs who are not running military-oriented campaigns. It includes 10 double-sided sheets (hexes on one side, squares on the other), and a set of Cardboard Heroes miniatures." The Traveller game in all forms is owned by Far Future Enterprises. Copyright 1977 - 1998 Far Future Enterprises. Traveller is a registered trademark of Far Future Enterprises.